There is an old saying - size is everything! When it comes to the value and overall relevance of ore deposits, there are two aspects of paramount importance. One is grade, the other is SIZE. Recent geological work at Thor is suggestive of a deposit that is much more extensive, and it also shows the major areas of growth opportunity at Thor. 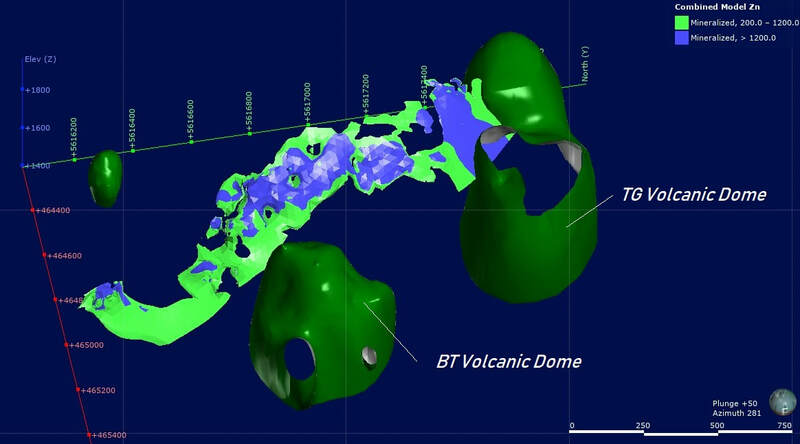 Recently, we have started using geological modeling software that enables virtually all of the information known to exist at Thor to be incorporated into a single geological model. This model has shown that the existing deposit is closely related to two volcanic dome, or intrusive bodies that have been emplaced in the Sharon Creek and Broadview Formations. These volcanic domes consist of volcaniclastic/tuffaceous rocks of the Jowett Formation. In the image above, the zinc content at Thor is shown and it can be seen to be along linear body that is almost 1.5 km in length. The two green bodies are volcanic rocks of the Jowett Formation, and are respectively the BT Volcanic Dome and the TG Volcanic Dome. These two features were identified after extensive exploration drilling, surface mapping and most importantly ground and downhole magnetic surveys. The volcanic domes are related to the hydrothermal activity that created the Thor deposit. It is thought that intrusive and volcanic rocks intruded sedimentary rocks on the sea floor around 450 million years ago, and hot fluids laden with lead, zinc, iron, gold, silver and other metals were emplaced adjacent to the intrusive and volcanic rocks. Efforts to expand the deposit are now focused on the area around the TG volcanic dome, and to the northwest in an area called the Megagossan. In conclusion, Thor is not a small deposit, and it is clearly going to get a LOT bigger!